Casadevall and Handelsman (2014) showed that female speakers were underrepresented at the American Society for Microbiology’s General Meeting and Interscience Conference on Antimicrobial Agents and Chemotherapy meetings between 2011 and 2013. They also showed that the presence of a female convener among symposium organisers substantially reduced the proportion of all-male symposia. 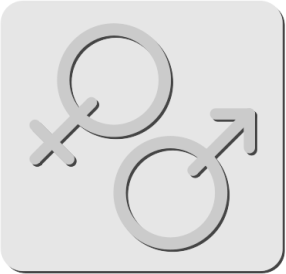 Davenport et al (2014) showed that the gender ratio of speakers at the American Astronomical Society meeting was representative of the gender ratio of attendees. However, women asked far fewer questions in talks and this was particularly pronounced in sessions chaired by men. Isbell et al. (2012) undertook an extensive analysis of 21 annual meetings of the American Association of Physical Anthropologists and showed that women were more likely to give posters than talks while men were more likely to give talks than posters. They also found that sessions chaired by either women only or men and women together contained far more female lead authors on presentations. Schroeder et al. (2013) carried out a more focused analysis of evolutionary biology symposia that showed that women were less likely to be invited to speak, and were more likely to decline an invitation than invited male speakers. This is by no means an exhaustive list of these studies, and the recent dates of their publication highlights the fact that the academic community is becoming increasingly aware of the issues with skewed gender ratios in conferences. What is interesting is that there is a clear difference in the gender ratio between the three talk types. Plenary talks are closest to parity at 60% male (although relatively few in number), 15 minute talks are similar at 65% male, but the 30 minute mini-plenaries were 88% male. Arguably 3:2 might be a reasonable gender role given the gender ratio of researchers in the field (I have no data on that, but I imagine that the RES has basic data on members?). Suffice it to say that because we don’t know what the general ratio is, it isn’t possible to perform any statistical tests because we can’t formulate a null model. However one testable hypothesis is that the presence of female organisers among symposium chairs enhances female representation among speakers. What we find here is that there doesn’t seem to be any effect of female organisers on female representation on symposia. First, the percentage of speakers in each symposium who are male is not significantly related to the presence or absence of women as chairs in the symposium (W=188.5, p=0.511). Second, there doesn’t seem to be any effect of women organisers on female 30-minute plenary speakers. The numbers of female speakers are too low for a chi-squared analysis of presence/absence female speakers vs presence/absence female organisers, but 1/8 (13%) were female when women were organising, while 5/31 (16%) were female when women were not organising. 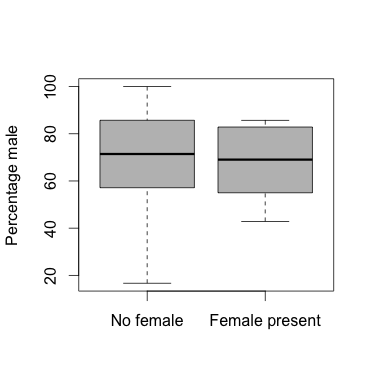 So it is clear that women gave fewer presentations at the Congress than men, but we don’t know how closely the ratio matches either the ratio of entomologists or the ratio of attendees. We see similar numbers of women and men giving both regular 15 minute talks and whole-conference, 60-minute plenaries. However, a large discrepancy appears when we look at the speakers asked to give the mini-plenaries at the beginning of each symposium. Interestingly, the presence of women among the organisers doesn’t seem to solve this, which runs contrary to evidence from previous studies (Casadevall and Handelsman, 2014). Casadevall, A. and Handelsman, J. 2014. The presence of female conveners correlates with a higher proportion of female speakers at scientific symposia. MBio, 5(1), pp.e00846-13. Davenport, J. R. A. et al. 2014. Studying Gender in Conference Talks — data from the 223rd meeting of the American Astronomical Society [manuscript]. At: arxiv.org, arXiv [physics.soc-ph]. Isbell, L. A., Young, T. P. and Harcourt, A. H. 2012. Stag parties linger: continued gender bias in a female-rich scientific discipline. PLoS, 7(11), pe49682. Schroeder, J. et al. 2013. Fewer invited talks by women in evolutionary biology symposia. J. Evol. Biol., 26(9), pp.2063-2069.